Married couple Pete and Ellie Wagner, after being taunted by relatives who think they will never have kids, start considering the option of adopting a child. Initially half-serious, they eventually decide to enroll in a foster parents course. Two social workers, Karen and Sharon, guide the hopeful parents on the steps to getting into becoming adoptive parents. The couples are brought to a fair where they have the chance to go up to kids that they are interested in adopting. Pete and Ellie walk by the teenagers, although Ellie shows hesitance over raising a teen. One of the teens, Lizzy, informs Ellie that they all know no one wants to adopt the teens. Impressed with Lizzy's behavior, Pete and Ellie talk to Karen and Sharon over potentially taking her in. The social workers inform the couple that Lizzy's mother is a drug addict who is currently in jail, and she set their home on fire because she left the crack pipe lit. It also turns out that Lizzy has two younger siblings, Juan and Lita. Although this seems like more of a challenge for Pete and Ellie, they agree to meet the siblings. The first meeting, however, does not seem to result in an immediate "bond", and Pete and Ellie reconsider. Pete and Ellie have Thanksgiving dinner with Ellie's family, where they announce that they intend to walk back on their decision to adopt. Once the rest of the family shows relief, making it clear that nobody really believed that Pete and Ellie could make it, Ellie gets upset and decides that they will go through with the foster care to prove that they can be good parents. Lizzy, Juan, and Lita begin to live with the Wagners. Although it is initially pleasant, it doesn't take long for things to get hectic. Lita refuses to eat anything but potato chips, and Juan reacts sensitively to every instance of trouble. Lizzy is also frequently bratty toward the Wagners, but especially Ellie, whom she blames for trying to replace her mother. The two parents frequently attend support groups with the other couples for insight on what to do with the kids. Pete's mother Sandy comes to visit to meet the kids, and instantly wins them over by treating the whole family to Six Flags. While there, Lizzy runs off with two friends from school. She doesn't reappear until later, and Pete grounds her for not informing him or Ellie as to her whereabouts. Although Lizzy remains bratty, Juan and Lita start to warm up to the Wagners. Lita calls Pete "daddy" when he fixes her doll, and Ellie gets a "Good night, mommy" from Juan after she comforts him from a nightmare. Realising how much Pete and Ellie care for Juan and Lita, Lizzy starts to go along with the others as they partake in family activities. Pete even invites her to a fixer-upper he is working on so they can wreck things for her to take out her frustrations. Pete and Ellie later find out that the kids' mother Carla has been out of prison for a few months and she wants to see the kids. They express their feelings about this during the group therapy, but the social workers tell them that their main goal is to keep families together and that the children might be reunited with the biological mother, after all. After meetings between the kids and their biological mother, the situation in the Wagner family degenerates. The children become more and more unruly and Pete and Ellie feel profoundly demotivated and frustrated. Pete and Ellie seek out the Fernandez family, who had spoken with their adoptive daughter Brenda at the training, for help with Lizzy. They inform the Wagners that Brenda is back in rehab, but Mrs. Fernandez tells them what a process it is to really form a bond and trust with the kids. The couple is horrified when they find Lizzy taking naked selfies to send to a guy at school named Jacob, and he sends her a naked photo of himself. When they take the kids to school the next day, they confront a boy named Charlie since they mistook him for Jacob. They then realize that Jacob is actually the school's 22-year-old janitor, and chase him into the school and assault him. Jacob is arrested, but so are Pete and Ellie, leaving Juan and Lita alone in the car, while Lizzy is humiliated. When Pete and Ellie return home, they are told by Sandy that they need to reassure Lizzy that they love her, because she doesn't feel that she is loved. The Wagners and the kids gather for a court hearing to decide whether or not the kids will go back to Carla or stay with Pete and Ellie. The judge reads a statement written by Lizzy detailing the things that Pete and Ellie have done, while defending Carla's claim that she is ready to take care of them again. Although Ellie tries to read a new statement, the judge won't let her. Carla is then given rights to the kids. Pete and Ellie sadly start to pack things up for the kids. Juan and Lita do not want to go, but Lizzy is ready. However, Karen and Sharon arrive at the house to inform Lizzy that Carla is not coming to get them, as she failed to show up that morning and appears to have started using drugs again. Heartbroken, Lizzy runs away while Pete and Ellie chase her. They catch up and tell her they love her, and eventually the trio reconcile. Four months later, the family goes to a new hearing. The judge finalizes Pete and Ellie's adoption of Lizzy, Juan and Lita. Rose Byrne joined the cast of the film on November 17, 2017. Isabela Moner co-stars alongside Mark Wahlberg for a second time, after previously working together on Transformers: The Last Knight in 2017. Octavia Spencer, Tig Notaro, Iliza Shlesinger, Gustavo Quiroz, Julianna Gamiz, and Tom Segura were added to the cast in February 2018, with filming beginning the following month, lasting until May 14. Instant Family was originally scheduled for release in the United States on February 15, 2019, before being moved up three months, to November 16, 2018. On November 10, 2018, it was announced the film's November 11 premiere in Los Angeles would be canceled due to the Woolsey Fire, but that a screening would take place at an evacuation center for victims of the fires. Instant Family is available on February 19, 2019 in Digital format and on March 5, 2019 in DVD/Blu-Ray format. Instant Family was rated PG in Australia and rated M in New Zealand. Instant Family grossed $67.4 million in the United States and Canada, and $53.2 million in other territories, for a worldwide total of $120.6 million, against a production budget of $48 million. In the United States and Canada, Instant Family was released alongside Fantastic Beasts: The Crimes of Grindelwald and Widows, and was projected to gross $15–20 million from 3,258 theaters in its opening weekend. It made $4.8 million on its first day, including $550,000 from Thursday night previews. It went on to debut to $14.7 million, finishing fourth at the box office. Deadline Hollywood said the opening compared to the $48 million budget "isn't spectacular, but there's hope that [the] film could leg out...over Thanksgiving." In its second weekend the film dropped just 14% to $12.5 million (including $17.4 million over the five-day Thanksgiving frame), finishing sixth. On review aggregator Rotten Tomatoes, the film holds an approval rating of 81% based on 132 reviews, and an average rating of 6.54/10. The website's critical consensus reads, "Instant Family may not quite capture the complexity of real-life adoption, but fittingly for the unconditional bond it honors, this flawed yet well-intentioned dramedy is ultimately worth the investment." On Metacritic, the film has a weighted average score of 57 out of 100, based on 28 critics, indicating "mixed or average reviews". Audiences polled by CinemaScore gave the film an average grade of "A" on an A+ to F scale, while PostTrak reported filmgoers gave it an 83% overall positive score and a 61% "definite recommend". ^ a b c "Instant Family (2018)". Box Office Mojo. Retrieved March 31, 2019. ^ Fujitani, Ryan (November 21, 2018). "Fantastic Beasts: The Crimes of Grindelwald Could Use a Bit More Magic". Rotten Tomatoes. Retrieved November 15, 2018. ^ N'Duka, Amanda; N'Duka, Amanda (17 November 2017). "Rose Byrne Joins Mark Wahlberg In 'Instant Family' From Paramount". ^ "Octavia Spencer, Tig Notaro Join Mark Wahlberg Comedy 'Instant Family' (Exclusive)". The Hollywood Reporter. ^ "Now Casting: Play a Couple in 'Instant Family' With Mark Wahlberg and Rose Byrne + 3 More Gigs". www.backstage.com. 1 March 2018. ^ Hayden, Erik (November 10, 2018). "Paramount Cancels 'Instant Family' Red Carpet in L.A. Amid Fires". The Hollywood Reporter. Retrieved November 10, 2018. 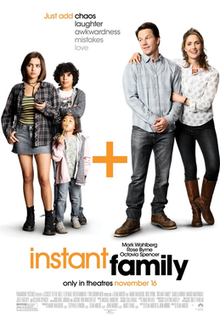 ^ "Instant Family DVD Release Date March 5, 2019". DVDs Release Dates. Retrieved 2019-01-25. ^ Rubin, Rebecca (November 13, 2018). "Box Office: 'Fantastic Beasts: The Crimes of Grindelwald' Sequel Heads for $250 Million Global Launch". Variety. Retrieved November 13, 2018. ^ a b D'Alessandro, Anthony (November 16, 2018). "'Fantastic Beasts: The Crimes Of Grindelwald' Steals $9.1M+ In Thursday Night Previews – Update". Deadline Hollywood. Retrieved November 16, 2018. ^ D'Alessandro, Anthony (November 25, 2018). "'Ralph' Scoring 2nd Best Thanksgiving Debut With $84M+; 'Creed II' $55M+ Live-Action Champ; 'Robin Hood' Goes Wrong At $14M+". Deadline Hollywood. Retrieved November 25, 2018. ^ "Instant Family (2018)". Rotten Tomatoes. Fandango Media. Retrieved March 23, 2019. ^ "Instant Family reviews". Metacritic. Retrieved March 23, 2019. This page was last edited on 13 April 2019, at 06:20 (UTC).